A number of high-profile guests were invited to the event. Among the guests were scores of top foreign envoys serving in Seoul. Freedom Day is a South African public holiday celebrated on April 27, each year. It celebrates freedom and commemorates the first democratic post-apartheid elections held on that day in 1994. The elections were the first non-racial, democratic elections where everyone of voting age of over 18 from every race group was allowed to vote. Previously under the apartheid regime non-whites were not allowed to vote. 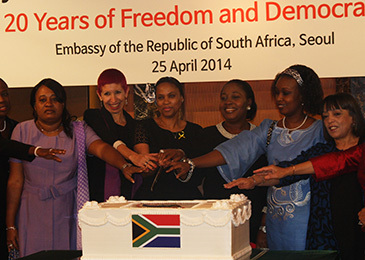 In South Africa a variety of events are held throughout the nation on the occasion of its "Freedom Day" in hopes of further promoting non-racism, non-sexism, and unity in diversity in line with the South African Constitution. South Africa's legislative capital of Cape Town is the site of the official celebrations where its president or other top political leaders address a large crowd gathered to commemorate Freedom Day. The bilateral relations between South Korea and South Africa have been fast improving since the two nations opened diplomatic ties on Dec. 1, 1992. Since then cooperation and exchanges at all sectors including politics, economy, and culture have been fast developing. In particular high-level political leaders including heads of state have visited each other’s country. In July of 1995 the former South African President Nelson Mandela visited Seoul. Two years later Vice President Thabo Mbeki also visited South Korea. 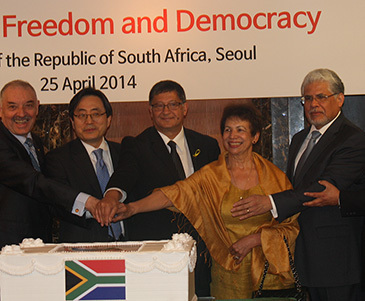 From South Korean side then Prime Minister Lee Hae-Chan visited South Africa in February of 2006. In November of 2010 the current South African President Jacob Zuma visited Seoul to attend G20 summit. Two years later in April he also visited South Korea to participated in Nuclear Security Summit (NSS). In July of 2012 then South Korean President Lee Myung-Bak visited South Africa to attend the 123rd Session of International Olympic Committee (IOC) in Durban. During the Korean War (1950-53), South Africa sent one air force squadron to aid South Korea from the Communist North Korean aggressors. The amicable relations were all cut off in 1978 at the start of US sanctions against the notorious Apartheid policy. Efforts had been sought from both nations after the abolition of racial discrimination policy since 1990, which led to eventual establishment of official ties at the end of 1992. Since the establishment of mutual ties trade also has increased by leaps and bounds. In 2004, South Korea was South Africa's 17th largest export destination. Now South Korea stands South Africa's 4th largest trading partner in Asia and South Africa is Korea's largest trading partner in Africa. 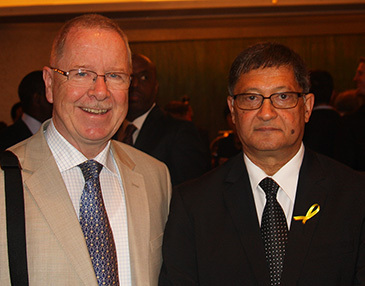 S. African Ambassador to Seoul Hilton Anthony Dennis (right) poses with President Alan Timblick of The Seoul Times. In 1997 the bilateral trade volume reached 3 billion US dollars. In 2011 the bilateral trade volume jumped to 5.4 billion US dollars. South Korea suffers a chronic trade deficit with the African country due mainly to her import of mineral resources including platinum, ferroalloys, copper, and aluminum. South Korea exports such items as vehicle, refined oil, cellular phones, and heavy construction equipment. Currently, South Korea’s investment to the African nation hovers at 2 billion US dollars. A total of 20 South Korea’s major companies are currently in operation in South Africa. They include Korea Resources Corporation, Korea Electric Power Corporation (KEPCO), Export-Import Bank of Korea, Samsung Electronics, LG Electronics, Samsung C&T Corporation, and Hyundai Motor Company. For details or inquiries call the South African Embassy in Seoul at 2077-5900.